Xavier University recently signed an agreement with MakerBot, a global leader in the desktop 3D printing industry, to bring a MakerBot(R) Innovation Center to the university’s campus. Xavier University joins a growing number of universities throughout the country that offer MakerBot Innovation Centers, which are designed to empower organizations to innovate faster, collaborate better and compete more effectively. Xavier is the first university in the Midwest and the first private college in the United States to implement a MakerBot Innovation Center. MakerBot is providing the consulting, technical support and training required to implement the MakerBot Innovation Center and will work closely with Xavier’s faculty to develop a curriculum that introduces professors and students to the world of 3D printing and its real-time possibilities. MakerBot is excited to join Xavier University for the grand opening of the MakerBot Innovation Center on February 4, 2015. Students, parents, business partners and community members are invited to take a tour of the new MakerBot Innovation Center during an open house from 2:00 p.m. to 4:00 p.m. The opening ceremony will start at 4:30 p.m. with a blessing by Xavier’s 34th president, Father Michael J. Graham, S.J., followed by speeches from University staff and MakerBot president Frank Alfano. The MakerBot Innovation Center at Xavier is a custom, centralized and scalable 3D printing solution that has been developed to meet the specific needs of the university. It is designed to create an environment in which entrepreneurialism, education and innovation can be cultivated and encouraged in the Cincinnati area and beyond. With the MakerBot Innovation Center, students, faculty and the community are provided opportunities to collaborate on Real-Time PrototypingTM, model making and small-scale creative and manufacturing projects. This provides a unique way to prepare students for the jobs of tomorrow by putting them at the forefront of technology and giving them access to a thriving community of innovators. With dedicated spaces for startups and networking, the MakerBot Innovation Center at Xavier is designed to attract local entrepreneurs, innovators and researchers. It will serve as a local innovation hub where students from different academic disciplines can gain invaluable hands-on experience by collaborating with entrepreneurs and researchers on real-world projects. The MakerBot Innovation Center for Xavier includes 31 MakerBot(R) Replicator 3D Printers (25 MakerBot Replicator Desktop 3D Printers, three MakerBot Replicator Z18 3D Printers and three MakerBot Replicator Mini Compact 3D Printers), a large supply of MakerBot PLA Filament, several MakerBot DigitizerTM Desktop 3D Scanners and MakerBot MakerCare(R) Protection Plans. At the core of the MakerBot Innovation Center is the MakerBot Innovation Center Management Platform, a proprietary and innovative 3D printing software platform that links all 30+ MakerBot Replicator 3D Printers together, provides remote access, print queuing and mass production of 3D prints, and is designed to streamline productivity and staffing of the center. 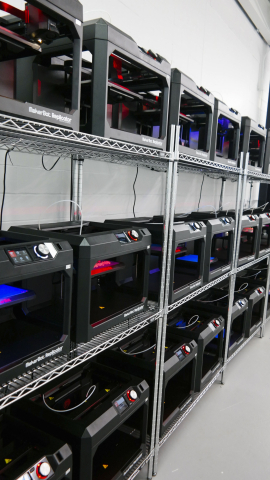 The scalable design of the MakerBot Innovation Center allows Xavier the option to easily add additional MakerBot 3D printing technology in the future. MakerBot is a leader in the desktop 3D printing industry and was founded in 2009 as one of the first companies to bring 3D printing to an accessible and affordable level. 3D printing has been around for close to 30 years, but up until 2009, the industry typically offered large mainframe-sized 3D printers that cost hundreds of thousands of dollars. MakerBot changed that equation by introducing desktop 3D printers. MakerBot now has one of the largest install bases and market shares of the desktop 3D printing industry, with more than 80,000 MakerBot 3D printers in the world and a robust MakerBot 3D Ecosystem that combines hardware, software, apps, materials, training, support, consulting, retail stores and partnerships in order to make 3D printing easy and accessible for everyone. Xavier University’s MakerBot Innovation Center is being built in conjunction with Consulting from MakerBot and training for university staff is being provided by MakerBot Learning. For more information on the MakerBot Innovation Centers, email innovation@makerbot.com, visit makerbot.com/innovation-center or call toll-free 855-347-4780. To learn more about the Xavier University Center for Innovation and its new MakerBot Innovation Center, visit xavierinnovation.com. Xavier University is a private university located in Cincinnati, Ohio, providing a liberal arts education in the Catholic, Jesuit tradition. Founded in 1831, the university is the sixth-oldest Catholic university in the nation. U.S. News & World Report ranks it No. 5 among 146 universities in the Midwest, and The Princeton Review names it as one of The Best 378 Colleges.